(Click to Enlarge) Human Umbilical Artery Smooth Muscle Cells: HUASMC. Isolated from a paired artery found in the abdominal and pelvic regions, and which in the fetus, extends into the umbilical cord. Cooper, K., I. Chun, D. Colter, S. Dhanaraj, A. Gosiewska, A. Seyda, C. Fang and C. Yang. 2016. 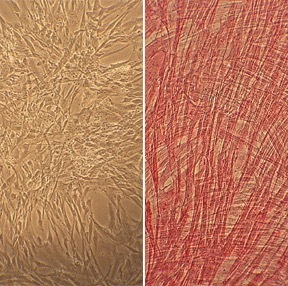 Tissue engineered blood vessel. Patent US 9290742 B2. Martin, D., X. Wang, Y. Li, H. Ford, B. Kjellsen, and S. Li. 2014. Angiotensin II activates the proteasome and stimulates vascular smooth muscle cell proliferation (866.10). FASEB J. 28:866.810. Kanie, K., Y. Narita, Y. Zhao, F. Kuwabara, M. Satake, S. Honda, H. Kaneko, T. Yoshioka, M. Okochi, H. Honda, and R. Kato. 2012. Collagen type IV-specific tripeptides for selective adhesion of endothelial and smooth muscle cells. Biotech. & Bioeng. 109:1808-1816. Yoshikawa, A., Y. Aizaki, K.-i. Kusano, F. Kishi, T. Susumu, S. Iida, S. Ishiura, S. Nishimura, M. Shichiri, and T. Senbonmatsu. 2011. The (pro)renin receptor is cleaved by ADAM19 in the Golgi leading to its secretion into extracellular space. Hypertension research. 34:599-605. Mora, J., R. Mora, B. Lomonte, and J.M. Gutiérrez. 2008. Effects of Bothrops asper Snake Venom on Lymphatic Vessels: Insights into a Hidden Aspect of Envenomation. PLoS Negl Trop Dis. 2:e318.